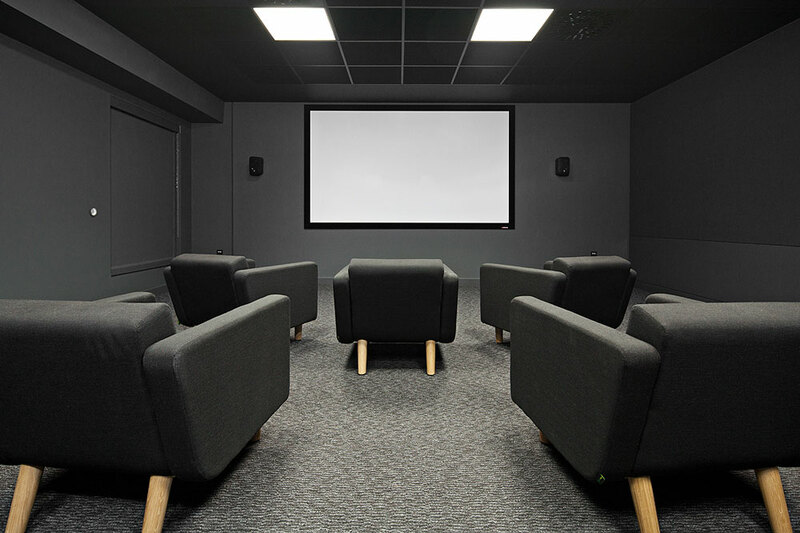 Lucy was MCM’s lead designer delivering a new HQ for Double Negative; their vision was to create a single headquarters building in central London to house their world class visual effects teams. Double Negative are Oscar winning providers of visual effects and post production services for the film industry, their work includes the Harry Potter, Inception and the new James Bond films. 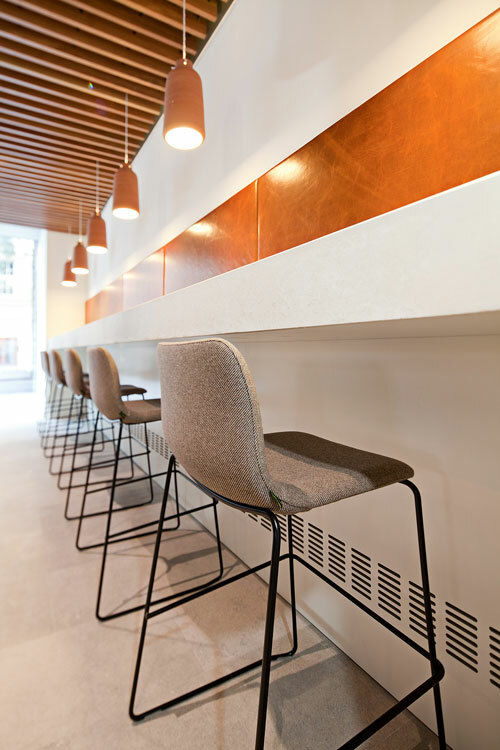 Double Negative had out-grown their existing offices in London’s Soho and with limited vacant space on offer at the size they required the company identified a property on Great Portland Street which was in the process of being refurbished by Great Portland Estates. 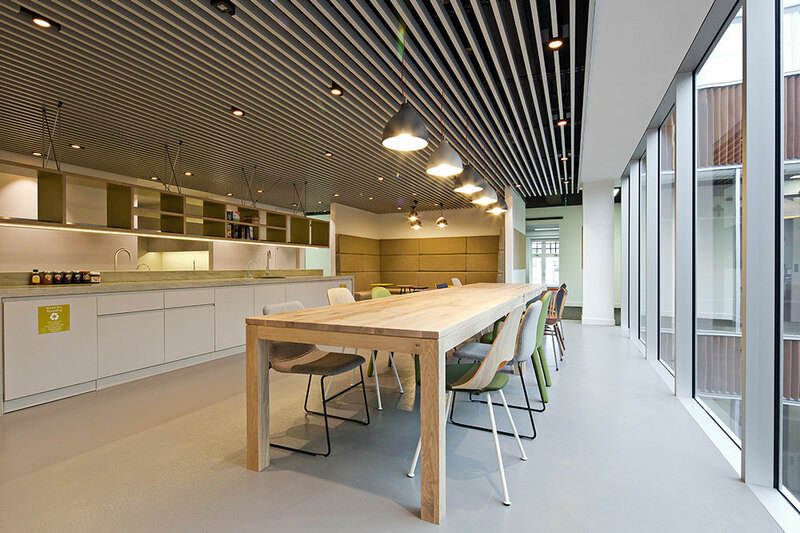 Double Negative secured the 86 000 sq ft space and set about on a journey that would see their 3 existing London sites combine under one roof, whilst facilitating their growth and improving working practices and productivity. The layout for the most part sees the floors divided into intensely cellular studio spaces for 10 people; careful consideration was given to the lighting and blinds as well as the choice of materials as these were critical in these spaces to ensure that the optimum working environment was created. The heat output from the vast number of CPU’s is controlled by the use of cooled workstations. 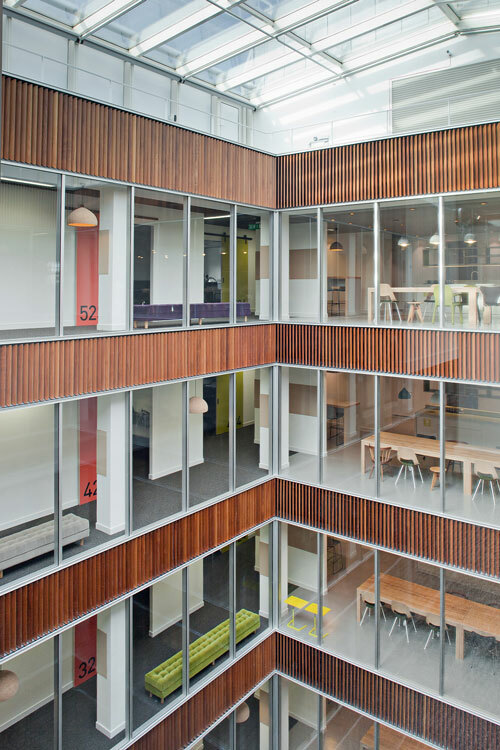 The long corridors adjacent to the atrium created by the cellular studios use accent colour sliding doors on industrial rails and randomly located pendant lights and velvet upholstered benches to create interesting views up and across the atrium. 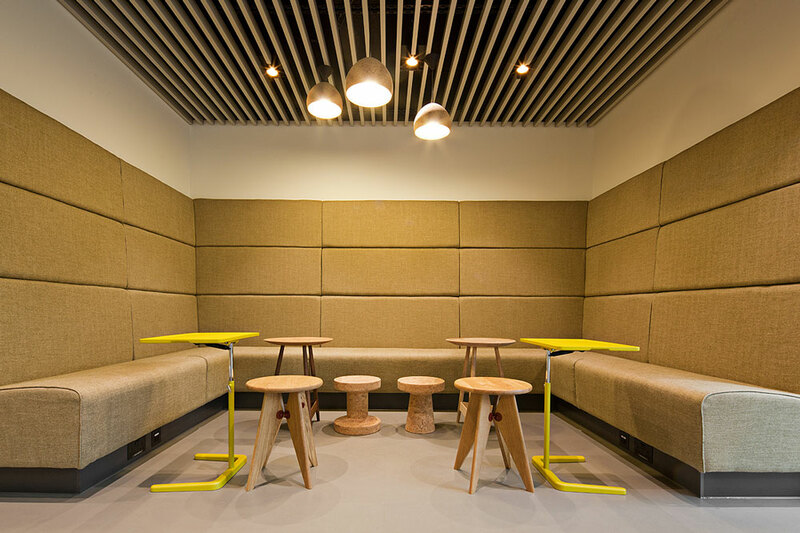 Each floor has a central refreshment hub facing out onto the atrium, these are designed as relaxed spaces for people to take time out from the very intense screen based activity; use of soft ambient lighting with accent lighting is prevalent. 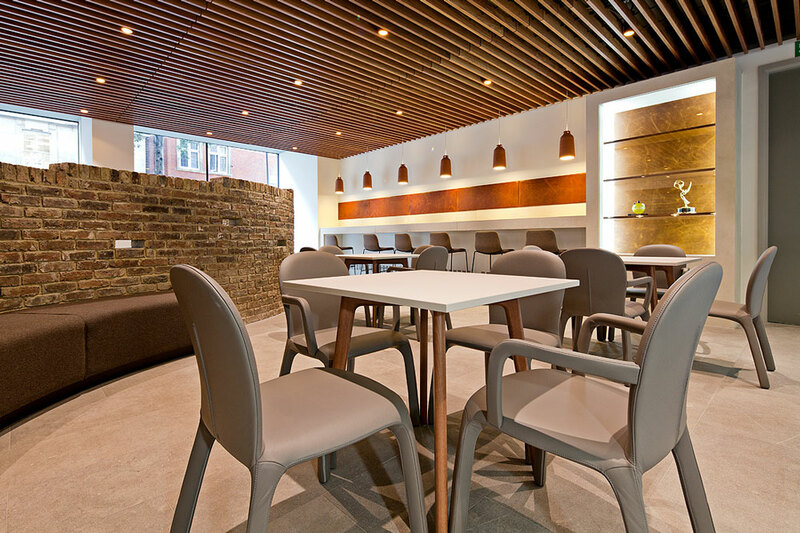 Large communal tables and a self-service cereal and toast bar dominate the space with softer seating breakout areas to the side. The reception area flows through to a cafe at the base of the atrium; this was made possible by infilling the atrium floor at ground level, providing a new flow to the reception space. 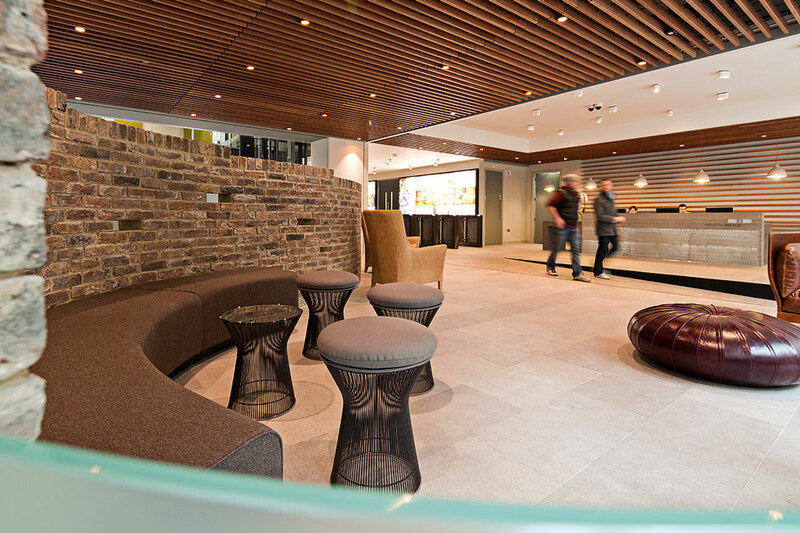 A large serpentine brick wall dominates the space; other sculptural features include a fiber optic LED illuminated concrete reception desk and concrete and leather Oscar display cabinet and touch down bench. Some of Double Negatives vast portfolio of work is displayed on an illuminated Barissol feature wall adjacent to the glass lifts. 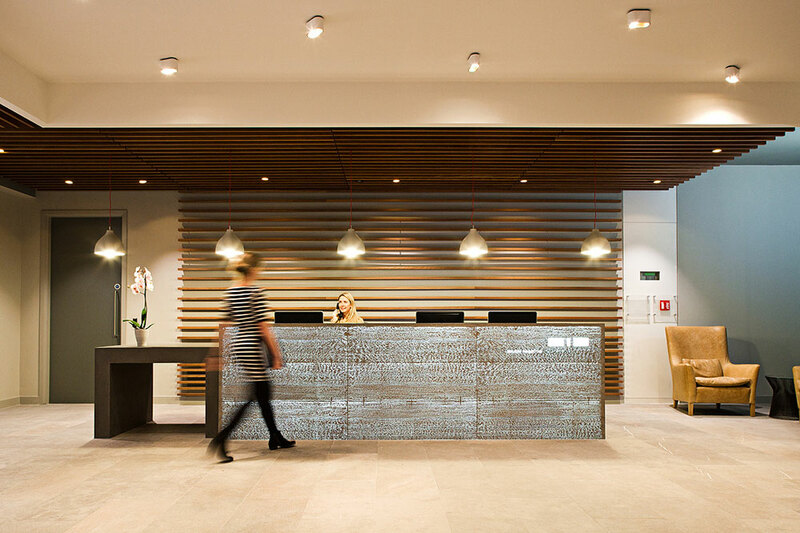 The reception area has large windows looking out onto Great Portland Street allowing Double Negative to give an insight into their business to all who pass by. One Sixty Great Portland Street recently won BCO Corporate Workplace Award for London and the South East. Lucy was a pleasure to work with and displayed a thorough understanding of our challenging brief.